I’m a firm believer that there is no such thing as too many books. Here are some of the titles I’m enjoying these days. One of my New Year’s Resolutions is to read one geek/tech/infosec book each month. 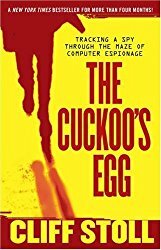 This month’s title is The Cuckoo’s Egg, by Cliff Stoll. The book has been recommended by several people I’ve met in infosec, and what I’ve read so far has been interesting and entertaining. 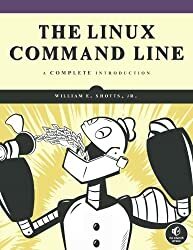 This book about the Linux command line was recommended to me by some SMEs (subject matter experts) who helped me resolve some configuration issues I was having while working my way through my next certification training. The guys were great, and we had great, geeky fun chatting while my system downloaded and installed software it needed. You know the saying… all work and no play makes anyone with half a brain cranky and zero fun to be around! 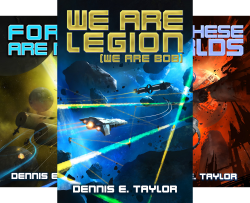 The good news is that this series has all sorts of geeky fun! I discovered the series on Audible, and it helped me wile away a number of hours commuting on the 405 freeway. Anyway, it has more geek in-jokes per page than any other book I have ever read or listened to. The science in the science fiction is pretty good, too!